The hands are one of the main platforms for the spread of harmful bacteria, so it is important that in workplaces, especially ones which require stringent hygiene conditions such as food preparation areas, and in healthcare scenarios, that staff and customers have access to excellent hand cleaning facilities. 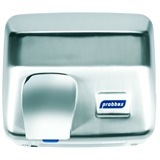 For where paper towels are just not enough, our range of excellent automatic and push button hand dryers help to provide a far more hygienic and economical hand drying solution ideal for public washrooms, catering and care environments. 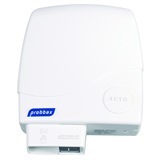 Our industrial hand dryers are designed to deliver high powered streams of air to effectively and hygienically dry hands, whilst keeping power consumption at a low. Coming in stainless steel and ABS shells, our hand dryer range includes manually operated “push-button” hand dryers, and hands free automatic hand dryers.